For mobile equipment manufacturers, choosing the right engine bay insulation is an important design consideration. Product designers and engineers need to understand their options, but it’s also important to understand how thermal-acoustic insulation is made. Engine compartment insulation that’s custom-fabricated doesn’t just reduce heat and sound. It helps you to control costs and improve quality. Engine compartment insulation can feature layers of thermal and acoustic materials that are assembled into a sandwich-like structure that’s between 1/2” and 2” thick. Sometimes, the top layer consists of an aluminum facing or metallized Mylar that’s laminated to an elastomeric foam. This facing reflects radiant heat, withstands contact with water and engine oil, and can be reinforced for abrasion-resistance. 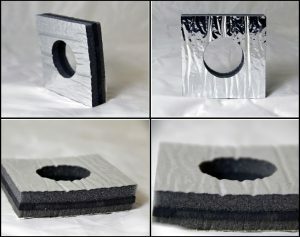 The middle of this insulation sandwich can include a layer of hard rubber that stops loud engine sounds and a layer of acoustic foam for additional sound absorption. The bottom layer can use a pressure-sensitive adhesive with a removable liner. Taped insulation is easy-to-install and eliminates the health and safety concerns that are associated with adhesive spraying. Thermal-acoustic insulation for engine compartments requires lamination and cutting. Lamination joins individual layers of material into a sandwich-like structure. Water jet cutting creates straight lines, rounded corners, and chamfers with 30° or 45° angles. Compared to manual cutting, water jet cutting means less material waste, closer tracking of material usage, greater repeatability, and higher quality. Parts marking, kitting, and custom packaging add value to engine compartment insulation. Parts that are marked with letters, numbers, or other identifying features can be custom-packaged into kits so that assemblers have everything they need in a single box. Instead of looking for 10 or 20 different SKUs in a warehouse, an installer can just open a box and get to work. Elasto Proxy supplies engine bay insulation to manufacturers of mobile equipment and military vehicles. We laminate materials into multi-layer structures and use both water jet cutting and abrasive water jet cutting equipment to make fine, fast cuts that don’t require paying for or waiting for tooling. Elasto Proxy also offers design assistance and help with material selection. Elasto Proxy’s capabilities also include parts marking, kitting, and custom packaging. Thanks to inkjet printing and UV drying, our parts marking system produces letters and numbers that are crisp, clean, and easy-to-read. Elasto Proxy can also ship specially-packaged kits on-demand so that, depending on your inventory practices, parts can go right from your receiving dock to your assembly line. Do you need thermal-acoustic insulation for mobile equipment or military vehicles? Would you like samples that you can show to co-workers in purchasing, engineering, or operations? Then request Elasto Proxy’s sample bag. 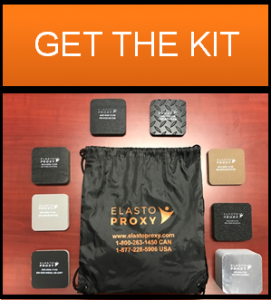 Packaged in a black-and-orange cinch bag, this convenient kit contains representative samples that demonstrate Elasto Proxy’s capabilities. To see it before you request it, watch this video.